A Coffee County woman said she's alive because her dog helped her escape a mobile home fire. 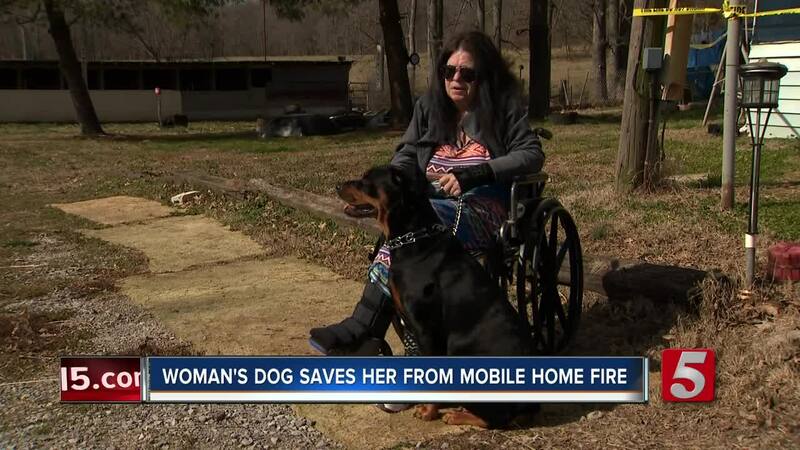 COFFEE COUNTY, Tenn. — A Tennessee woman said she's alive because her dog helped her escape a mobile home fire. A couple weeks ago, Cherrie Fletcher fell on tough times. "I went through strokes and the doctor fixed the ankle, and then on Saturday I broke the wrist, and then the house burnt on Sunday," Fletcher said. Hopi Grace, Fletcher's beloved Rottweiler, started barking in her face which woke her up to the smoke on January 13. Fletcher said, "Without Hopi, I don't think I'd have made it, I could have had a heart attack and died in there." Fletcher was able to get in her wheelchair, and attached Hopi's collar to a leash. "She just jerked me out and knocked the door open with her nose, and out on the porch we went," she said. Unfortunately, Fletcher's other Rottweiler didn't make it out. Firefighters buried the dog in the yard. Fletcher's blind cat, Pinto Beans, is gone too. "She tried to get on my lap and she couldn't and I was trying, I couldn't grab her with this thing on ... She went back in the fire and that was the worst part, I couldn't get them out," she said. Even though she assumes the worst, Fletcher still looks for her cat, calling "Is Pinto there?" Looking at the charred interior of the abode is hard because she's called it home for 28 years. "Just want to cry, cause I've lost everything," she said. With a broken ankle, she can't look in the home for keepsakes, or clean it out. "There ain't no way," Fletcher said. Right now she's trying to raise money to buy a new mobile home. "For a single wide mobile home to put back in there, and it's one of them FEMA homes, it's $30,000, on a $750 income, you can't pay for that," she said. So far, she's had trouble finding an apartment that takes Rottweilers, and there's no way she would ever part with Hopi. If you would like to help the fire victim during this time, she has a GoFundMe page. You can also donate to First National Bank in Manchester, Woodbury, and Murfreesboro in Tennessee. The account was opened on behalf of Cherrie Fletcher by her daughter, Sherry Rosales. Anyone can donate to the account at the bank. Fletcher said the fire was caused by an electric wiring malfunction.